A SIMPLE MOIST MUFFIN THAT YOU CAN MAKE IN LESS THAN 30-MINUTES. When I bite into a muffin I expect it to be moist, flavourful and to not fall apart in my hands. 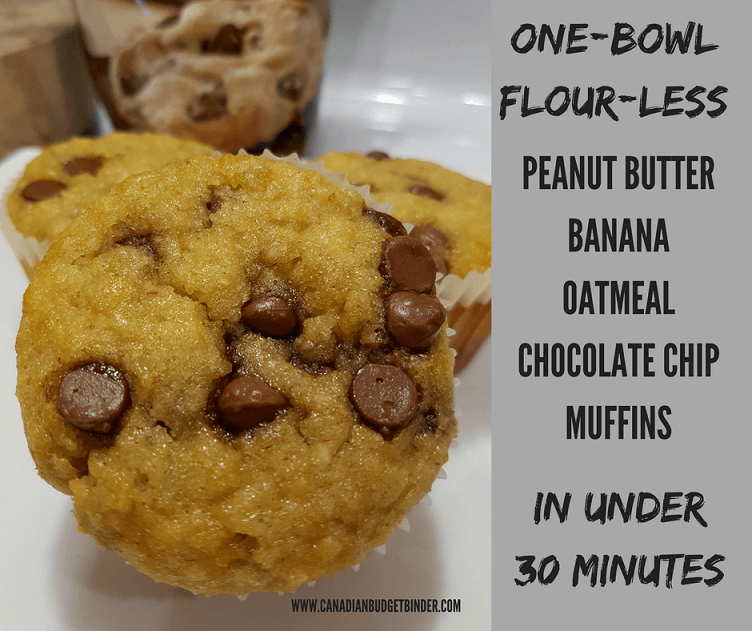 These one-bowl flour-less peanut butter banana oatmeal chocolate chip muffins are the perfect breakfast muffin or ideal for a quick snack on the go. Our almost three year-old son absolutely loves Tim Horton’s chocolate chip muffins and knows the difference if we try to swap one out for something else. Living with a picky eater is tough especially when they are still learning to talk. I tried to pass off raisins the other day for chocolate chips and met with a disgusted look. 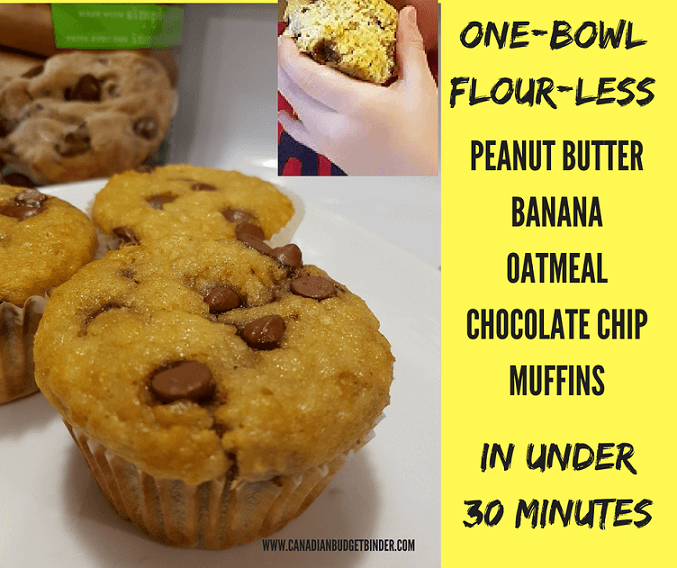 I know it sounds like a mish-mash of ingredients but I don’t think I’ve ever seen our son demolish a muffin the way he does with these peanut butter banana oatmeal chocolate chips muffins. I’m pretty sure Mrs. CBB and I just watched him eat it because it’s not often we see him thrilled to eat something we make at home. Mrs. CBB and I talked about ways we could get our son to eat something other than toast in the morning for breakfast. He has had no interest in cereal, oatmeal, yogurt, eggs or anything but bananas and toast since he turned one and a half years old. This has been frustrating for us because up until then he would eat just about anything we put in front of him. To combat this we started to offer him peanut butter banana oatmeal chocolate chip muffins that he has helped to make. I believe having him participate in the recipe process has helped us over one hurdle because he absolutely loves these banana oatmeal chocolate chip muffins. The idea is to make the muffin as healthy as we can and sprinkle a few chocolate chips in it for him. This includes adding secret ingredients such as oatmeal, yogurt and flax-seed when possible. If you’ve had a chocolate chip muffin at Tim Horton’s you know there are lots of chocolate chips in it so our aim was to cut that in half. We also went the flour-less route since we don’t use much all-purpose flour in our house these days apart from almond flour or coconut flour. Related: What’s the difference between Almond Flour and Almond Meal? One last sneaky ingredient was the oatmeal which he never eats but is good to fill the tummy and keep you satisfied a bit longer than toast would. If you’re a muffin baker you know that creating different types of muffins is fairly easy but having them rise properly and bake in the centre is key. It’s important to Mrs. CBB and I to try and offer our son as much variety as possible to expose him to different tastes and textures. 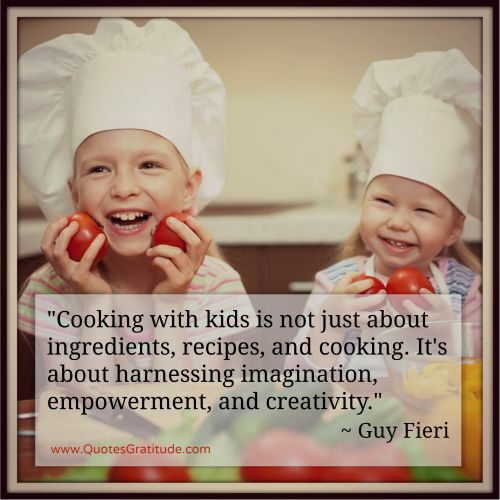 This is essentially what every parent wants to do but it’s harder when you have a child who refuses almost everything. Even if we let him go hours without eating he still only wants what he wants. It’s frustrating yes. Our peanut butter banana oatmeal chocolate chip muffins were a hit and will be making the recipe rounds every few weeks. When creating this recipe we didn’t want to make a dozen at a time since freezing them wouldn’t work for us. You could certainly freeze them but he likes that fresh out of the oven muffin and to be honest these are so easy and quick to make anyways. How to make peanut butter banana oatmeal chocolate chip muffins. Peanut Butter Banana Oatmeal Chocolate Chip Muffins are one-bowl muffins that you don't have to fuss over for great results. In a large bowl add all the ingredients except chocolate chips and mix together well to combine. At the end fold in the chocolate chips leaving a few to sprinkle on the tops of the muffins before you bake them. Line a muffin tin with 6 liners and fill to the top with muffin batter and sprinkle a few chocolate chips on top. Bake in the oven for 12-15 minutes until golden brown and a toothpick comes out clean. That's all. Store in a container for a few days or freeze. Now that is what I call an easy recipe because I like when everything can get thrown in one bowl mixed and then baked. Ta-da! 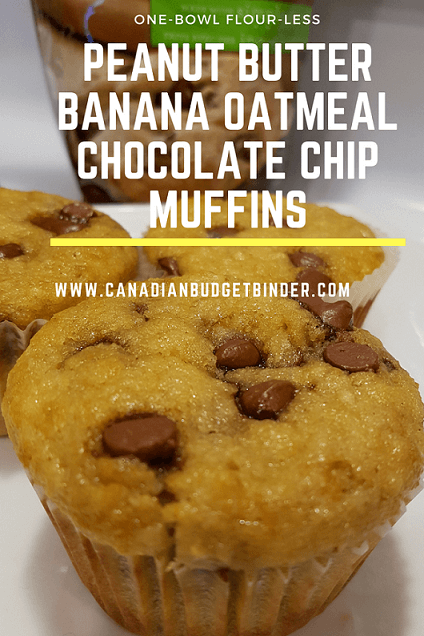 Enjoy these peanut butter banana oatmeal chocolate chip muffins and let us know what you think. I’m almost certain everyone will love them. Yes, that’s our boy in the photo above eating his freshly baked muffin! !